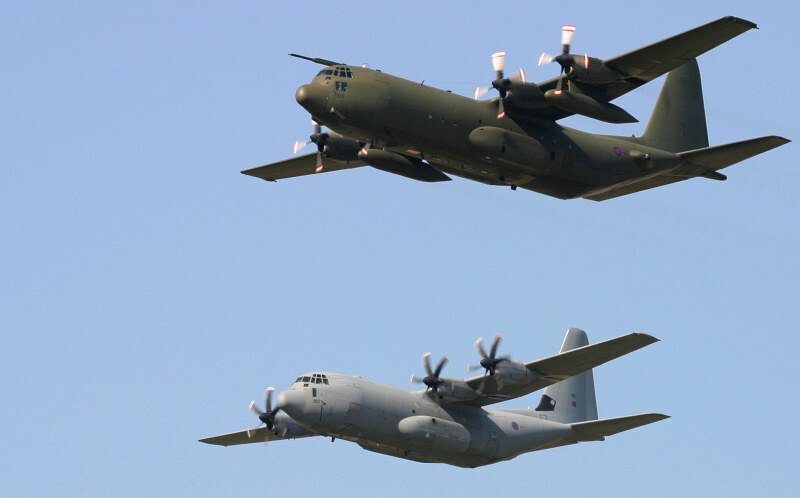 The RAF operate the C-130K (C1/C3) and the newer C-130J (C4/C5) Hercules from RAF Lyneham in Wiltshire. The newer 'J' model features more powerful Rolls-Royce Allison turboprop engines and more efficient propellers then the 'K' model. It also has a modern all glass cockpit, head up displays, integrated navigation, communication and defensive systems. The way to tell the two versions apart is that the 'J' version has six bladed propellers compared to the four bladed propellers of the 'K' version. Also the newer 'J' version has the refuelling probe fitted to the left-hand side above the cockpit rather then the right on the 'K' version. The older 'K' version is actually 15ft longer and carries external fuel tanks under the wings while the more efficient 'J' version does not need them. The 'K' model is operated by 47 and 70 Sqns and the 'J' model is flown by 24 and 30 Sqns. 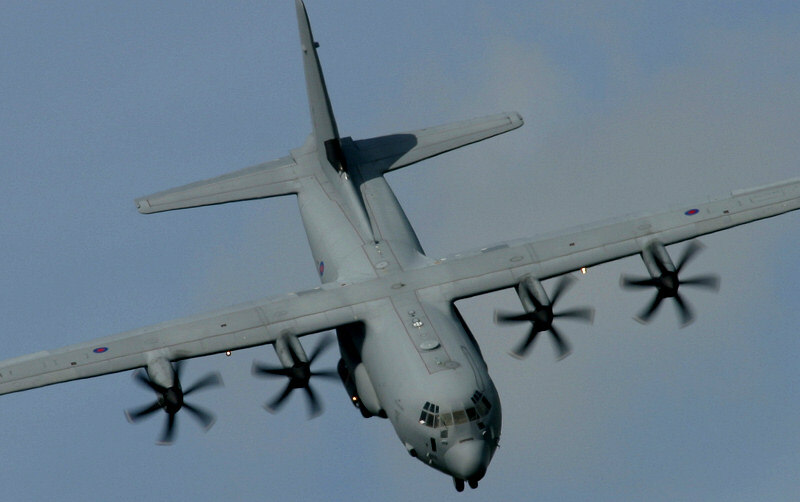 The Hercules usually has three crew: pilot, co-pilot and an air loadmaster. The aircraft has many roles including cargo and troop transport, air drop of personnel and stores, aeromedical evacuation, and famine relief. It also has the ability to land in a short distance and on poor quality runways. The Hercules has recently been involved in the earthquake relief in Pakistan and is still on deployment in Afghanistan and Iraq. The 2006 display Hercules will be the newer 'J' version. There will be 2 crews splitting the shows throughout the 2006 season. First crew are: 30 Sqn - Captain: Trev Waller, Co-Pilot: Dave Kirby, Air Loadmaster: 'Spud' Simpson. Second crew are: 24 Sqn - Captain: Ben Brandon, Co-Pilot: Phil O'Brien, Air Loadmaster: Sgt Daz Addison. 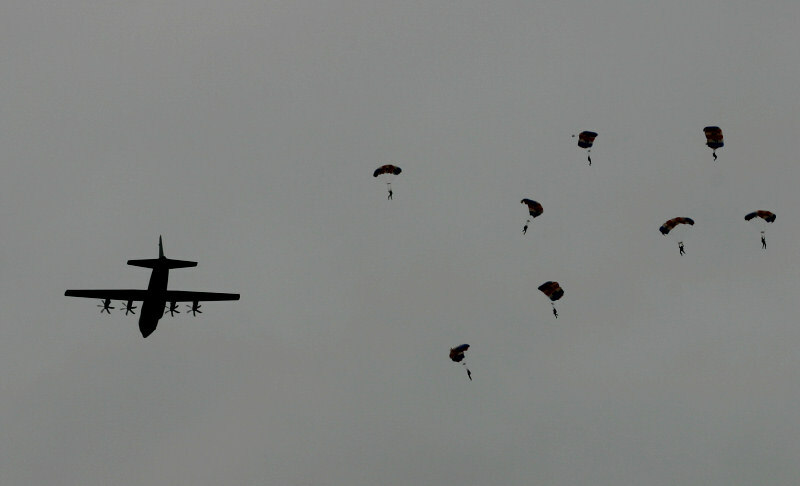 The C-130J Hercules is also used for dropping the RAF Falcons parachute team using a different crew. RAF C-130J Herules at RAF Waddington Airshow. Flt Lt Trev Waller was born in Cheshire in January 1969 before moving to Scotland. He was educated at the High School of Stirling Secondary school, Richmond-upon-Thames Tertiary College and the University of Manchester Institute of Science and Technology. Trev was a member of the Air Training Corps before joining Manchester and Salford University Air Squadron. He joined the RAF in September 1987 as a University Cadet and after completing Initial Officer Training at RAFC Cranwell went on to flying training at RAF Linton-on-Ouse in North Yorkshire then RAF Finningley in South Yorkshire. He graduated as a Pilot in September 1994 and was posted to the C-130K Hercules at RAF Lyneham in Wiltshire. He completed several tours of duty on different Squadrons at RAF Lyneham and was one of the first crews to convert to the new J model Hercules. During his time at Lyneham Trev has flown on both marks of Hercules and completed operational sorties in Iraq, Sierra Leone, the Balkans and Afghanistan. He is now an Instructor on the J model Training Flight where he undertakes continuation training and checks for all Squadron pilots as well as coordinating Night Vision Goggle airland training. Flt Lt Trev Waller is the 30 Sqn Display Pilot for this year's RAF C-130 display. Flt Lt Dave Kirby was born in Leicester in Sep 1971, He was schooled in Leicester, at Rowley Fields Community College and Wyggeston & Queen Elizabeth Ist VI th form college. Dave joined the RAF in May 1990 as a Navigator and after completing Initial Officer Training at RAFC Cranwell went on to Navigator Training at RAF Finningley in South Yorkshire. 'Kirbs' graduated as a Navigator in June 1992 and was posted to the Tornado GR1. He completed a tour of duty at RAF Bruggen in Germany during which he flew operational sorties over Iraq on Operation Southern Watch. In Mar 1997 Dave was posted to XV(R) Sqn at RAF Lossiemouth as an Instructor Navigator and completed the Qualified Weapons Instructor (QWI) course, winning the trophy for best crew. He continued to instruct on XV Sqn until Aug 1999. Dave started his second career in the RAF in Sep 1999 when he was posted to RAF Linton-on-Ouse to undertake pilot training. He completed the basic phase of flying training, during which he won the Navigation & Leadership Trophies, and was posted to RAF Valley. Dave withdrew from training at Valley in May 2001 and was posted to 3 FTS RAF Cranwell to undergo Multi Engine Conversion. Dave was posted to the C130J as one of the first pilots to fly the C130J with no previous Hercules experience. During his tour as a Co-pilot Dave was on the first TacAT course and was qualified to drop the RAF Falcons Parachute Display Team. Dave attained Captaincy after 3 years on the C130, and now is an Instructor on J Tactical Training Flight, where he takes qualified crews and trains them in air drop and Low Level flying. Dave is the 30 Sqn Copilot for this years C130 display. Flight Sergeant 'Spud' Simpson was born in Dundee in July 1970. He finished his education at Kingdown School in Warminster, Wilts. before joining the RAF in May 1988 as an Airloadmaster. Following basic training at RAF Swinderby he completed the Airmen Aircrew Initial Training Course and Airloadmaster training at RAF Finningley. Spud was posted to RAF Shawbury, graduated as a helicopter crewman in 1989 and was posted to 72 Sqn, RAF Aldergrove in Northern Ireland as a Wessex Crewman before moving to the Hercules in 1990. After a tour on 30 Sqn operating the C-130K (including a four-month detachment to the Falkland Islands) he was posted to LXX Sqn and undertook a Tactical Air Transport course. 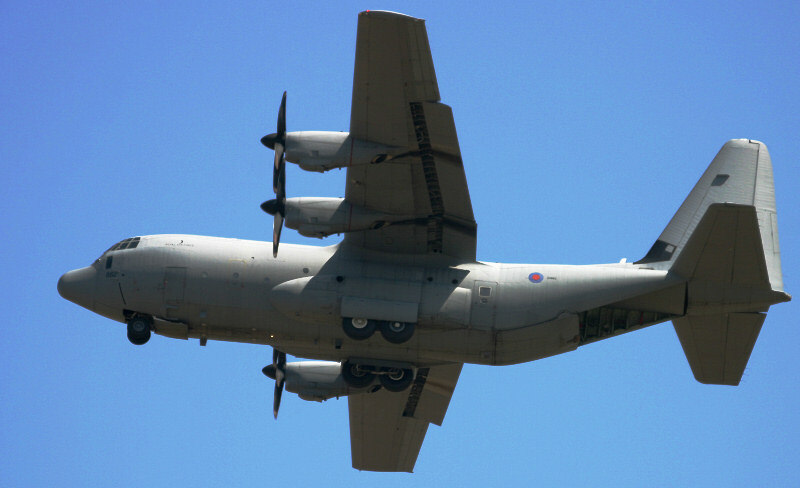 After two tours on LXX Sqn Spud was posted to the C-130J and graduated from the 4th "J" course in 2001. After a posting to 24 Sqn he took up an instructional postion. During his tours on both marks of C-130 Neil has flown operational sorties in Bosnia, Kosovo, Sierra Leone, Afghanistan and Iraq. Spud is now a member of the C 130J training flight where he trains and examines Loadmasters on the C-130J. 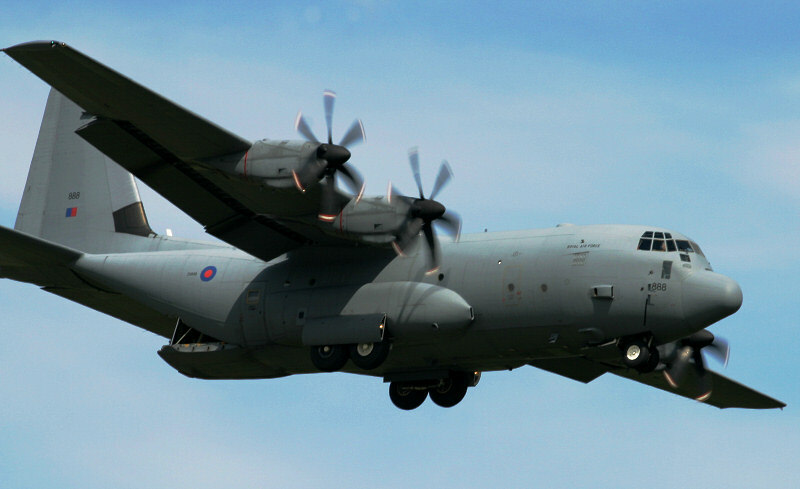 FS 'Spud' Simpson is the 30 Sqn loadmaster for this years C-130J display. RAF C-130J & C-130K at the Royal International Air Tattoo 2005. Flt Lt Ben Brandon was born in Croydon, Surrey in January 1972. He was a member of 450 Sqn Air Training Corps at RAF Kenley and gained his PPL at the age of 17 following the award of a RAF flying scholarship. After 3 years flying the Bulldog T.1 with the University of London Air Squadron he joined the RAF in October 1993. Advanced Flying Training in the Jetstream T.1 followed Basic Flying Training in the Tucano T.1 and Elementary Flying Training in the Firefly T67M. He graduated as a Pilot in 1997 and was posted to the C-130K Hercules at RAF Lyneham in Wiltshire. Following a tour as a flying instructor on the Jetstream T.1 Ben returned to RAF Lyneham to convert to the new J-model Hercules in 2003. He is now an instructor on the J Conversion Flight on 24 Sqn. Flt Lt Ben Brandon is the 24 Sqn Display Pilot for this years RAF C-130 display. Flt Lt Phil O'Brien was born and raised in Leicester. After leaving school he worked for 5 years as a Quantity Surveyor before joining the Royal Air Force in 1991. Having completing Initial Officer training at RAF Cranwell, he then began his flying training and was awarded his wings in April 1995. Phil was then posted to the Hercules C130K in September 1995 where, after conversion training, he completed a tour as a Co-pilot on N0 24 Sqn. In 1999 he was posted to The Central Flying School at RAF Cranwell where he completed his training to become a Qualified Flying Instructor. 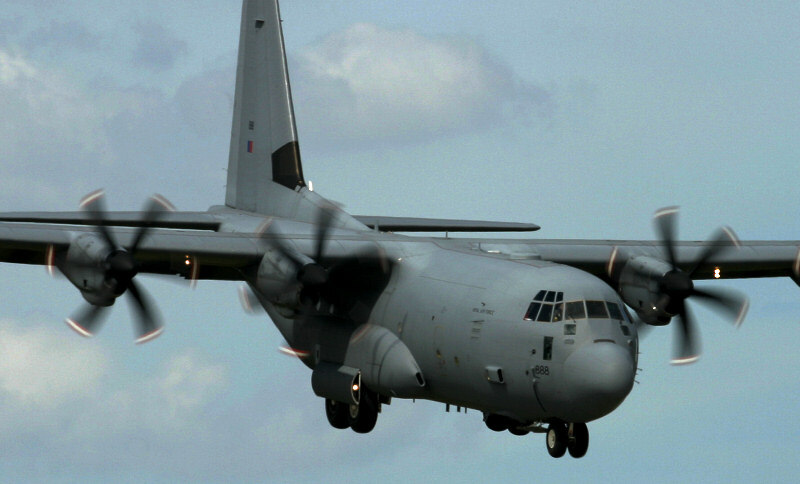 He was then posted to RAF Leeming and Northumbrian University Air Squadron for a tour before returning to RAF Lyneham in 2003 where he qualified as a Captain on the new C130 J model Hercules. After spending 18 months as a Captain on No 30 Sqn, Phil was posted to his current tour on 24 Sqn, once again as an instructor, this time on the C130-J Operational Conversion Unit. RAF C-130J Herules at RIAT 2005. Sgt Daz Addison was born in Grantham in November 1973. He finished his education at Baysgarth School in Barton On Humber before studying for a degree in Electronic Engineering at Bradford University. Daz joined the RAF in January 1996 as an Air Loadmaster. After completed the Airmen Aircrew Initial Training course at RAF Cranwell and Progressed to Airloadmaster training, again at Cranwell. After graduating he was posted to the C-130K OCU at RAF Lyneham. He spent 1 tour on 24 Sqn including a 6 week detachment to the Falkland Islands before been posted to 30 Sqn. After this tour he was posted to the C-130J and graduated from Course 7 in November 2001. After 18 months on 24 Sqn, Daz was again posted to 30 Sqn undertaking Flight Instructor post training and examining qualified loadmasters. During tours on both marks of Hercules, Daz has flown on operational sorties in Countries of the former Republic of Yugoslavia, Sierra Leone, Afghanistan and Iraq. Daz is now a member of the J Training and Conversion Flight converting loadmasters to the C-130J and examining and training qualified ALMs. He is promoted to Flight Sergeant as of the 1st July 2006. RAF Falcons at RAF Cosford Airshow 2005. Thanks to Flt Lt Trev Waller and the rest of the C-130J Display Crews. Technical Specifications of the C-130J Hercules. Accommodation: Flight deck crew of two plus one loadmaster. Up to 128 infantry; 92 paratroops; 8 pallets or 24 CDS bundles.